So you’re looking for the cheap golf gifts under $10? To make your choices easier, I’m splitting the best golf gift options into two categories—the essentials and the novelties. Also, if you’re a person who doesn’t like to read, I’m including some of my suggestions in chart form so you can skip the actual content. In this category I highlight golf gifts under $10 that satisfy a golfer’s basic needs. Think along the lines of balls, tees, etc. With these gifts, you can’t really go wrong. A golfer will need them at some point along the way, and they’ll be happy they don’t need to buy these items on their own. Golfers lose more golf balls than they’d like to admit, and unless that special someone in your life is a semi-pro golfer, they’re going to need a small stockpile of golf balls to sustain their hobby. Every golfer needs tees, and the Pride Professional Golf Tees are some of the best reviewed golf tees on the internet. 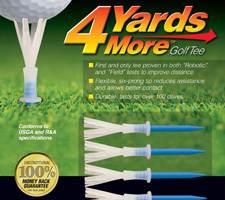 Golfers are always looking for a way to hit the ball further, and 4 Yards More Golf Tee claims to help them do just that. These are a bit of a deviation from a standard golf tee, so if you’re purchasing for someone who likes to be different or someone likes to have an edge, they’ll appreciate this gift. Putting is one of the crucial skills needed to score well in golf, so any tricks golfers can use to improve their consistency is worth it in the long run. One trick that golfers often employ is “marking” their ball. The Greenkeepers Line M Up is designed to help golfers do that quickly and consistently. In this category I highlight golf gifts under $10 that are unique, helpful, or downright ridiculous. These would make good cheap gifts for golfers who are quirky or already own the essentials, but would still appreciate golf-related gifts. This is the fun golf gift category, and if you’re unsure about some of the essentials, I would go this route. One of the best golf gag gifts ever. The ball explodes and vanishes into thin air upon impact. Great for pranking friends (and enemies) on the course. 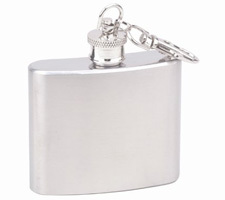 Golf and alcohol often go hand in hand, so this mini drinking flask will be well-received for both its functional and humorous value. Keychain sized, but actually holds 2 fluid oz. This sleeve of golf shot glasses continues the drinking theme, as each screw top golf ball shot glass can hold 1.5 oz of your favorite liquid. This one-of-a-kind game includes a putting green, putter, flag, golf balls, and a ‘Do Not Disturb’ door sign. Have you played 18 holes of golf during the summer? If so, you know how miserably hot it can be. These cooling towels are a favorite for golfers who despise the heat. Obviously there are other cheap golf gifts I could have included, but I thought this list would give shoppers a good starting point. If you find any clever gifts that you think others should know about, feel free to share them in the comments section below. If you’re willing to spend a little more, you may want to check out our Gifts for Golfers Under $50 or the most forgiving golf ball options. Here’s the best golf gifts under $10 in chart form one more time.